Dr. Michèle Corriveau feels blessed to work for an organization that encourages community involvement. She is a chiropractor and works at the Byward Chiropractic Clinic, a sister organization to the Glebe Chiropractic Clinic. Both organizations give back to the community in a number of ways. 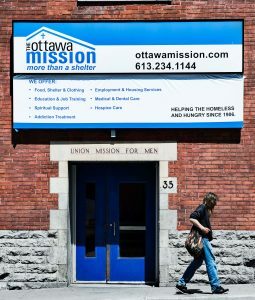 In Michele’s case, her flexible work hours have allowed her to volunteer at our shelter every two weeks – as she has been doing for over a year now – offering chiropractic services to those staying at The Mission.